Fact Or Fiction: Dee Ford Elite? Look, despite what some may have been trafficking on Twitter yesterday, Joe just cannot fathom how any intelligent, reasoned NFL watcher cannot believe trading a third-round pick for Jason Pierre-Paul was not a robbery of the highest order engineered by Bucs AC/DC-loving general manager Jason Licht. And as much as Joe loves JPP and what he brought on the field, his leadership off it was just as good. But JPP’s current contract ends after the 2020 season. He will be 32 when his pact expires after next season. Sooner or later, Father Time catches up with players. He is undefeated. So as Joe has done in the past, Joe is pleading for Licht to get a pass-rushing defensive end. Preferably, that will come in the draft. But if a proven stud edge rusher can be had in free agency, that’s even better. Currently, monster Chiefs defensive end Dee Ford will be a free agent in four weeks if the Chiefs are silly enough to let him dip his toe into the free agent waters after a 13-sack season. If so, Licht should pounce. However, Ford, who registered one more sack than JPP did this year, recorded only his second double-digit sack season of his career. He just finished his fifth season in the NFL. Is it fact or fiction Ford is an elite pass rusher? This question motivated Seth Keysor of The Athletic to jump to the film lab. Some of his findings are below. Midway through the season, teams started chipping Ford a great deal more. Prior to that, certain measures like sliding protection his way or rolling quarterbacks away from him were being utilized. Teams never game-planned around Ford’s presence in previous years, and them doing so affected his win percentage. It’s also worth noting that Ford’s win percentage, while not elite, was up significantly from last season. His loss percentage was down as well. This is despite teams game-planning around his presence more. So there can be no doubt that Ford was a much more effective player on a snap-by-snap basis than he had been previously. Ford improved in multiple facets as a pass rusher this season. The most noticeable thing is that he has improved his flexibility and technique to corner much quicker around the edge. Keysor also noted that in his film study, while Ford made a jump in his ability to get heat on opposing quarterbacks, his biggest improvement was his ability to defend the run. So based on all of this film study, Keysor believes Ford has turned the corner as he improved not just in pass rushing, but in getting after the ballcarrier. In other words, he’s a well-rounded defender. 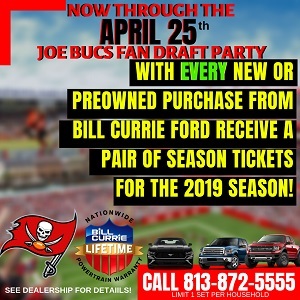 In Joe’s dream, the Bucs would use money previously allocated to Gerald McCoy, who is on the wrong side of 30, to sign Ford. Then, with the No. 5 pick in the draft, the Bucs would get the defensive tackle so many fans pant over, this Quennen Williams from Alabama. Jason Pierre-Paul, Williams, Vita Vea and Ford? Now you are talking about a front line that is cooking with gas, highlighted by three linemen 28-years old or under and two tackles who are under 25. Dee Ford is not an elite player. There are upper class tiers just one or a few ticks shy of this word people use too loosely and too quickly. Elite football players are pure dominators and usually are remembered a generation or two after their playing days due to their impact and overall remembrance. Dee Ford is a really nice edge rusher who still inevitably has holes in his game and had a great year, and is on the upward trajectory. None of this has anything to do with whether or not Tampa should pursue his talents, because they should if available, and he’d obviously make a world of difference – but not elite, not yet (to answer your question). Sign me up. And if Williams/Allen/Bosa are all gone trade back and land BPA OL/DT (Jonah Williams / Ed Oliver / Wilkinson) or Devin White / Greedy Williams if they are going to be instant pro bowler types rated much higher than anyone else left on the board. It’s weird. It was his 5th year to finally have good year I believe – ? And I’m guessing this was from rookie contract so best numbers in contract year ? Doug Martin all over again ? Don ‘t get me wrong those numbers are filthy. But Just think those 15 sacks may cost close to a deal worth 15 mil per year. Probably 13-15 range ? Lotta loot for one good year. 5 years 85 Million is his projected contract. Is he worth 17M a season? Can we afford to pay him that? I think the answer to both those questions is no. I’ll throw one more question with the same answer, is he elite? He is not on the level of Mack, Miller, Garrett, Lawrence, or even Watt. He is not even a top 5 rusher and maybe not even top 10, so no he is not elite. This is an Olivier Vernon again where the dude balls at the right time and his production is never going to match his salary. Hell to the no !!! Go Bucs. Truly ‘Silly Season’ is upon us, or should we call it ‘Dreamer’s Delight’? Why do we even have these discussions? Just one article ago many wanted to divest ourselves of our #2 TE, Cam Brate, because Licht overpaid for his services ($7 mil a year). But now it’s a great idea for him to overpay for a 4th Free agent DE at $16 mil a year? (We already have JPP, Nassib & Gholston and this draft is supposedly loaded with DLine talent). Licht bought the SECOND most expensive DLine in the NFL last year … $49 mil (per https://www.spotrac.com/nfl/positional/2018/defensive-line/). Only Jacksonville outspent us on the DLine ($51 mil). Guess what … NEITHER of us made the playoffs. NEITHER did the Panthers ($43.5 mil) or the Dolphins ($38.2 mil), two more of the Top-5 when it came to DLine spending in 2018. Only the Rams ($41.3 mil) in the Top-5 made the playoffs). Thank heaven we now have Bruce Arians & his highly-experienced coaching staff FINALLY scrutinizing our Bucs roster. Father Time isn’t the only one who’s undefeated Joe. So is Jason Licht … Undefeated in terms of overspending on FAs and cobbling together rosters that scream MEDIOCRITY. Don’t even think about that signing! No FA for DE this year. Too deep a draft pool. Maxx Crosby and Sutton Smith look like good candidates in later rounds of draft. Like Charles Omenihu also but too early to guess his round. Predictions are all over the board. When u can’t draft u have to look at free agency in the end. and if we are in a 3/4??????? It has already been reported he’s not going anywhere. Move on to your next dream. Why is this even an article….much less AGAIN. Everyone has already commented, and knows…in all forms of reported media, that the Chiefs are going to release Justin Houston as a cap casualty. Which means they tag Ford, and continue to negotiate till the July 15th franchise tag deadline. i dont think he’s elite…..but he’s a very good player…..i wouldnt be mad if we signed him…. Dee Ford will likely bring about $15-17M on the free market. He’s a good young player – but not THAT good. Better to draft a DE fairly high – in a draft class loaded with DL talent and get 4 years of cheap production out of him – than to pay Dee Ford $65M over the next 4 years….